The Samsung DualView TL225 (also known as the ST550 in some markets) features a 12.2-megapixel sensor with a 4.6x zoom lens. The Samsung TL225's lens ranges from 27mm - 124mm equivalent, a generous wide-angle to a moderate telephoto. Maximum aperture varies from f/3.5 to f/5.9 across the zoom range. The Samsung TL225's lens includes optical image stabilization, which should help reduce the likelihood of blur caused by camera shake, as part of what Samsung terms Dual Image Stabilization. The other part of the function is Digital Image Stabilization, which combats blur using the camera's firmware, automatically raising the camera's ISO sensitivity as needed. The Samsung TL225 also has a 3.5-inch widescreen LCD display with 1,152,000 dots of resolution, which equates to around 384,000 pixels. This unusually high-res display features a touch panel through which most control is achieved. The Samsung TL225's Smart Gesture user interface recognizes specific fingertip gestures on the touch panel and responds accordingly. For example, tracing your finger in a cross mark on the screen will delete the current photo, while tracing a circle will instead rotate it. To switch between photos, you simply drag your finger to one side across the panel. In addition, the Samsung TL225 includes an orientation sensor, which allows you to switch between photos by tilting the camera body to one side or other. The LCD touch panel is also used in record mode, with a tap of the finger on your subject being all that's needed to manually set the focus point. Holding your finger over the subject for two seconds will set focus and then trigger the shutter; alternatively you can press the shutter button immediately after focus lock is achieved. In addition, the Samsung TL225's display offers haptic feedback, which uses a slight vibration of the display surface as a method of tactile confirmation when the user presses an on-screen control. This vibration is accompanied by a beeping sound as a further form of confirmation. Either of these can be turned on or off individually. A particularly unusual feature of the Samsung DualView TL225 is the secondary color LCD on the camera's front surface adjacent to the lens. Samsung describes this display as being hidden, as it shines through a clear plastic cover on the front of the camera; a tap of the finger on the display brings it to life. It serves as an alternative to the articulated displays found on some cameras, which can often be tilted and/or swiveled so as to allow them to be seen from in front of the lens -- useful for self portraits and group shots using a timer. The front-panel display is also significantly smaller and lower resolution, at just 1.5-inch diagonal and 61,000 dots. Samsung also uses the front-facing LCD as a countdown display for timer shots (ensuring everybody knows when to smile), a "smiley face" icon displayed when smile shutter is being used, and a display of certain key setup variables such as flash or macro modes via icons. Perhaps most unusually, the front display can show a brief clown animation when the camera is in Children mode, intended to catch your child's attention so they look directly at the camera while their photo is taken. The Samsung DualView TL225 includes face detection capability with both smile and blink detection functions, which can be used to automatically capture a photo when everyone's smiling, and then retake the image if anybody blinks. There's also a "Beauty Shot" mode which smooths skin tones on detected faces, and offers three user-selected levels of smoothing. The face detection is also used to offer a Red-Eye Fix function which automatically locates and corrects for this common image defect. In addition, the TL225 includes Smart Face Recognition technology, which allows twenty individuals' faces to be registered in-camera and then recognized in subsequent shots. Once identified, those individuals' faces will be given priority over unrecognized faces in the scene when determining exposure variables, and can also be searched for in the Smart Album playback mode. The Samsung TL225 also has a generous selection of scene modes aimed at keeping things approachable for beginner photographers while still offering a degree of control over images, plus a Smart Auto mode which automatically selects one of 16 scene modes as appropriate to the current scene. The Samsung DualView TL225 has the ability to record standard or high-definition movies with sound at 30 frames per second in H.264 format, with a maximum resolution of 720p (1,280 x 720 pixels). Connectivity options include HDMI video via an optionally available adapter allowing the camera to be connected to the latest high-definition displays. Alternatively, the Samsung TL225 includes standard-definition NTSC / PAL video output. Power comes courtesy of a proprietary SLB-07A lithium-ion rechargeable battery. The Samsung TL225 stores images on the tiny microSD / microSDHC card format, or in 55MB of built-in memory. The Samsung DualView TL225 began shipping from September 2009, with a street price of about US$299. Samsung broke out of the pack in 2009 when it introduced the DualView digicams at a jammed press conference in New York City. The DualView models were the first cameras with two LCD screens--a small one on the front, a much larger one on the back. Now the people could properly frame themselves as they captured self portraits of their smiling faces with arms outstretched, checking out their visages on the small screen. The screen also acts as a "watch the birdie" trick as animations appear to hopefully captivate young children. As one exec said at the time: "Why didn't we think of this before?" That little screen created a blockbuster and the Samsung TL225 (and less expensive TL220) are the best-selling cameras Samsung ever introduced, according to the company. Besides the unique front 1.5-inch LCD, the Samsung TL225 has a 3.5-inch touch screen that's your main interface, as there's a minimal number of physical keys, just like the recently reviewed Sony TX5 and Canon SD3500. The touch screen GUI isn't quite as slick as the other two but overall the Samsung TL225 is surprisingly sophisticated for what basically looks like an point and shoot digicam. How sophisticated--and more importantly--how good a camera is the DualView TL225? That's what you came here to find out. Look and Feel. The Samsung DualView TL225 is a very attractive digicam. Our review sample had a gloss-black finish with a cool purple accent running along the left edge, top and right side of the camera. If purple's not to your taste, it's also available in black with a red accent. The ring surrounding the lens has a silver metallic finish. Also here is the flash and AF Assist/self-timer lamp. The front 1.5-inch LCD screen blends in to the background when off so it's nicely camouflaged. You just tap it if you want to take a self-portrait but more on this later. Since this is a touch-screen camera, there are only four hardware controls--power on/off, shutter, zoom lever, and Playback button. The zoom is small and may not be for everyone. Since the Samsung TL225 is 3.9 inches wide, it just make sense that there's nothing on the rear other than the 3.5-inch screen and surrounding bezels. Overall the Samsung TL225 measures 3.9 x 2.4 x 0.7 inches and weighs 5.78 ounces (164g) with battery and card. The unobtrusive pinhole mic is on the top while the speaker is on the left side. Bottom line? The compact Samsung DualView TL225 just looks slick. Lens. The Samsung TL225 has a 4.6x Schneider-Kreuznach zoom with a nice wide-angle of 27mm, with 124mm the maximum telephoto setting. This is a good range, especially on the wide side, for landscapes, while still allowing for portraits and reasonable telephoto shots. Maximum apertures are f/3.5 at wide-angle, and f/5.9 at telephoto. We found soft corners at wide-angle with slight barrel distortion, but it wasn't too bad. Telephoto was softest in the lower right corner but again not terrible, and there was slight pincushion distortion. Controls. There aren't many on this touch-screen digicam. As mentioned earlier almost all of your interactions with the Samsung TL225 will be with the 3.5-inch TFT LCD rated 1,152K dots, which is about as good as it gets in 2010. There's no four-way controller or mode dial on the Samsung TL225, as navigation is done on the touchscreen. If only Federal legislation were as simple and straightforward! Then again, the GUI does have a waft of Congress about it, since it's rather quirky and bizarre. We'll get into this more deeply in the "Use" section. Modes. The Samsung TL225 is a point-and-shoot, so auto functions are the order of the day. If aperture and shutter speed adjustments are on your must-have list this is not the camera for you. However, the Samsung TL225 lets you change these settings in the Night Scene mode (f/3.5 or f/9.1 with speeds ranging from 1-16 seconds); though at those speeds, you'll need to use a tripod or place the camera on a flat surface. Similar in a fashion to the Sony/Canon systems, when you power up, icons appear on the left and right sides of the Samsung TL225's main viewing area. You simply tap them to make adjustments. For the main shooting operations, press the camera icon on the left and you have access to Smart Auto, Auto, Program, Scene, Dual Image Stabilization, and Movie. Press the one you want and the camera is ready to go. In Smart Auto, the camera guesses the scene in front of it and a relevant icon appears. 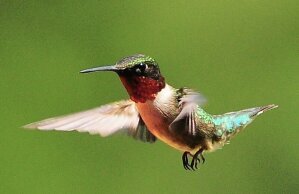 The options include Macro, Landscape, Sunsets, Close-ups of colorful subjects (i.e. flowers) and so on for a total of 16. This is a nice assortment and the camera did a good job choosing the appropriate subjects. 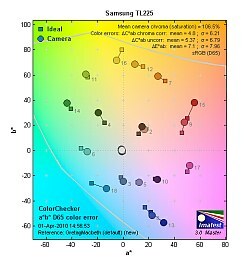 Auto is simply that and the Samsung TL225 will not make anything but basic adjustments. I don't know why manufacturers have Smart Auto and Auto especially for mainstream buyers who probably wouldn't know the difference between one or the other, but that's just me. Program allows for a bit of control, but not much that would excite serious shutterbugs. You can adjust exposure compensation, white balance, ISO, Face Detection and sharpness, but not the aperture or shutter speed. Scene is exactly what it says, offering 13 options including the standard Landscape, Night, Portrait, and the not-so-typical Beauty to adjust skin tones and cover blemishes. The Children mode puts the 1.5-inch front LCD to work, showing an animation that will hopefully catch your kiddies' attention so they'll look at the camera. Movie mode lets you choose resolution and frame rate. 1,280 x 720 HQ is your best option, available at 30 or 15 frames per second. A higher compression (lower quality) 720p mode is also offered at 30 or 15 frames per second. 640 x 480 at 30 or 15 frames per second, and 320 x 160 at 60, 30 or 15 frames per second are also available. Clips with mono sound up to 20 minutes can be recorded in the MPEG-4 part 10 AVC H.264 format. The Dual OIS setting gives access to two types of image stabilization: optical and electronic for shooting in very low light. Optical image stabilization can be engaged in all other modes including Movie, but sound from the IS system may be picked up while recording. Optical zoom is also supported during movies, though audio recording is muted while zooming. Menus. You'll live or die using the touch screen. It's not nearly as sophisticated as those from Sony and Canon. And there are some functions that are simply bizarre. Icons flank the main view screen. You tap on the camera icon on the top left which gives access to the main mode options as detailed above. Once you make your choice there's an "up" arrow on the lower level of the screen. Tap this and a submenu appears, showing the options for that mode. In Smart Auto you can only change resolution from 1 megapixel to 12 megapixels. Go into Program mode, though, and your options include everything from ISO to exposure compensation. Note: If the camera is on a tripod, it can be harder to tap the right spot on the screen. If that's the case, tap the menu icon on the bottom center of the screen and you get an expanded version of the adjustments available along the bottom row. You can swipe up and down through the lists to get to the function you want in order to make adjustments very quickly. Tilt control doesn't work well. Icons also appear on the left to change focus type (normal/macro), engage the self timer, and so on. Then you enter bizarro-land. Press the arrow on the right of the screen and a shaky camera icon appears. 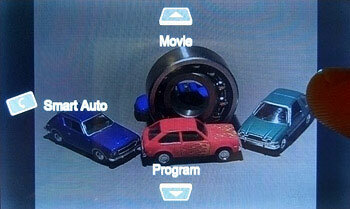 While holding this with your thumb, you tip the camera forward and icons show that if you do that, you'll engage the Movie mode. Tip it back toward you again and you're in Program. Move it counterclockwise and you're in Smart Auto. This is one of the weirdest interfaces I've used. Why did they do this? Your guess is as good as mine. In Playback mode, touching the "shaky" icon puts the camera in slideshow mode, or lets you select a favorite, or protect a photo. Whatever--it's a flop. That on the table, if you stick to the basic adjustments, the DualView touch screen system is straightforward and you'll be up and running in short order. Storage and Battery. The Samsung TL225 comes with a 3.7V 720 mAh lithium-ion battery rated for a below-average 180 shots (per Samsung's measurements). Purchasing a spare battery makes sense given the drain from the two LCD screens. The Samsung TL225 uses an in-camera method of charging rather than a separate plug-in device. The supplied cable connects to a proprietary jack on the bottom of the camera then to a supplied AC adaptor. Take the adaptor off and use the same cable to connect via USB to your computer. Samsung only supplies an RCA A/V cable, no HDMI cable for connecting to an HDTV. Given Samsung is the largest maker of HDTVs in the world, you would think they'd want their consumers to enjoy a camera/HDTV experience. But like Sony, they need to squeeze a few extra bucks from shoppers for this key accessory. To make matters worse, there's no mini HDMI jack on the Samsung TL225; you need a special adaptor that plugs into the bottom of the camera. Terrific. Another disappointment is the fact that the Samsung TL225 uses microSD or microSDHC cards (according to the user manual, Samsung only guarantees compatibility up to 4GB). Most photographers have little experience with microSD cards unless they have them in their cell phones. They are very small, hard to handle, and you'll typically use an adaptor to plug it into your card reader. It's not a total deal breaker but Samsung should be more consumer friendly in its media choices. Outdoors. Though somewhat vibrant, I liked how the Samsung TL225 rendered these tulips. I had the opportunity to use the DualView over a period of weeks. Fortunately, spring had finally arrived so there were plenty of colorful blooms to attract me, like bees to flowers--if you'll forgive the seasonal metaphor. Stills were shot at full 12.2-megapixel resolution with best compression levels. Videos were also shot at maximum resolution and frame rate. Smart Auto was used often, as was Program. I delved into the menu options where appropriate, but remember this is a point-and-shoot with hardly any manual adjustments (focus, shutter speed, aperture) other than in one Scene mode. If those tweaks are on your list, definitely look elsewhere. Since the raison d'etre of the Samsung TL225 is its DualView system, I had to take some shots of me and my wife while visiting a local botanical garden. The system worked fine. You simply tap the front screen to turn it on, aim it toward yourself and frame your shot. With Face and Smile Detection enabled, the camera clicks when you show your pearly whites--no need to press the shutter. It's a little slow to detect and act on your smile, slower than the Sonys we've used, but overall this is a fun feature and we can easily understand why social networkers love it. All that's missing is built-in Wi-Fi for quick uploads. I attended a family Christening and had the chance to try out the built-in animations in the Children scene mode. The clown animation fascinated several youngsters and kept them focused on the camera--exactly what it was intended to do (note that the clown does not rotate in vertical mode, but that'll probably just make it more fun for the kids). It did not work on my two cats who merely seemed annoyed that I disturbed their naps. Self-framing. It's easier to look the way you want with the forward-facing screen. The Samsung TL225's interface is a bit quirky. When you're in Smart Auto you can't turn on the front screen via the touch menu--you have to tap the front. When you're in Program by tapping the set-up icon on the lower left you can turn on the front LCD and for some reason it shows one of the icons (Flash) there. I couldn't figure out the reason for that one. Also sometimes tapping the front screen got it to work quickly while at other times I had to tap it repeatedly to make it come to life. Although my Samsung TL225 review sample worked well for the most part, another camera sent to the IR labs didn't fare so well. It didn't turn on with a light tap and a harder tap cracked the front cover. Luke, our lab tech, had difficulty turning the front screen off using taps and had problems accessing icons while the camera was on a tripod. Ouch! I did not use a tripod so that was not an issue for me. Zoom. The Samsung TL225 has a pretty good zoom range, from 27-124mm. Overall I found the Samsung TL225 quite responsive. The AF system grabbed focus quickly. Shutter lag performance was impressive but a little slower at tele (0.47 second) than at wide (0.36), which is normal. Prefocus is 0.126--a decent, but not stellar figure. Startup takes 1.9 seconds, not bad. With all of the flowers and trees in bloom, we gave the Samsung TL225's Macro mode quite a workout. Images looked good with reasonably close focusing and close view. Samsung states 5cm in macro, 3cm in Super Macro are as close as you can get. Results from our lab were pretty sharp across most of the sensor. The flash didn't throttle back well but we're talking pretty close in our usual tests. Colors of tulip rows were pumped pretty dramatically, but other scenes seemed fine. Flash exposure is a little uneven at wide-angle, according to our tests. ISO is raised to 480 for grainy, soft results. It's more even at telephoto but ISO rises to 640. With my ISO test subject I found digital noise under control up to 200 with 400 getting too soft for my tastes. Also noticeable was the difference between the optical image stabilization system of the Samsung TL225 and competing Sony/Canon set-ups. Let's put it this way--Samsung has some work to do in order to catch up. In addition, auto white balance was pretty yellow in incandescent light while manual looked all right, but somewhat cool and underexposed. Outdoors with plenty of sunshine there were no problems. Like most point-and-shoots, sunshine and a flash are the order of the day for quality output. In order to watch movies on your HDTV, you'll need to spend around $40 for an HDMI accessory kit available from Samsung or other retailers. We also used a microSD card adaptor to play the clips on our PCs using Windows XP Pro and Vista Premium (older desktop, newer laptop). Video quality is about right for a pocket camera: Not perfect, but usable. What's nice is that you can zoom optically while recording, both in and out, and if you move the cameras slowly enough, the image stabilization makes for a decent image. Note that you'll likely need a more modern computer with at least a dual core or equivalent processor to play most HD files, as it takes a little more horsepower. Playback. Press the playback button and there's a variety of ways to review and edit your shots. You can shake the camera to start a slideshow, if that floats your boat. On the left of the screen are a series of icon for more choices. Tap the face icon and you'll see every show with a face which is a fast way to find a portrait. You can rotate or resize images plus you can change the Photo Style and add Special Effects. Style options include soft, vivid, forest, retro, cool, calm (? ), classic (sepia), negative and custom RGB. With the Special Effects you can adjust the background, make them Elegant (change brightness and softness), even adjust brightness, contrast and saturation. One of my favorites was Noise so if you're not happy with the graininess you get from shooting at high ISOs, you can add some more! Easy Windows uploads. Just plug the Samsung TL225 into a Windows PC and software loads from a virtual disk on the computer and offers to upload your images. When it comes to getting your pictures onto your computer, the microSD card does present a problem, as few computers have a reader. However, Samsung has a pretty ingenious solution, at least for Windows computer owners. Take the included USB data/charger cable and unplug it from the charger module, and then plug it into your computer's USB port: The computer waits a few moments, then comes alive, loading both the microSD card and also what the computer sees as a CD/ROM drive. This drive then loads Samsung's IntelliStudio software, which offers to upload your images. But that's not all. The software can help you edit your photos, with various filters and basic tools like brightness and contrast, and you can even add frames and get help uploading your photos to YouTube or flickr. A menu item also allows you to install the software on your computer. It's a simple but useful program, easily added via the camera itself. A great trick, one we haven't seen before. Sharpness: The wide-angle end of the Samsung DualView TL225's zoom is very soft in all but the lower-right corner, but blurring doesn't extend far into the main image area. At telephoto, blurring is slight to moderate in the corners, with the strongest occurrence in the lower right. Again, blurring does not extend far into the frame, and is less noticeable than at wide angle. Geometric Distortion: There is surprisingly little barrel distortion at wide-angle (0.3%), and about as much pincushion distortion (0.26%) at telephoto. Chromatic Aberration: Chromatic aberration at wide-angle is a bit high, though with relatively dim cyan pixels appearing spread over a large portion of the black target marks. At telephoto, pixel count is lower, but with a more noticeable red cast. Macro: The Samsung DualView TL225's Macro mode captures sharp details at the center, with a small amount of softness and chromatic aberration creeping in from the corners. Minimum coverage area is 2.21 x 1.66 inches (56 x 42mm). The camera focuses so closely that the flash is blocked by the lens at the most extreme closeup, and the flash doesn't throttle down well, creating a very strong hot spot. 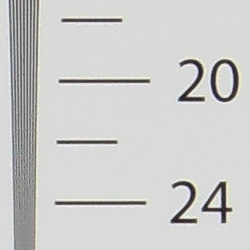 In Super Macro mode, the minimum area measures 1.61 x 1.21 inches (41 x 31mm). Detail is again good, with moderate softening in the corners. Viewfinder Accuracy: The Samsung TL225's main LCD monitor showed about 100% coverage at wide-angle, and about 99% at telephoto. Excellent performance here. We did not test the coverage of the front LCD. Color: Color is fair overall, with some noticeable oversaturation in strong reds and some bright blues. However, bright yellows are actually a little muted, as is cyan. In terms of hue accuracy, the Samsung TL225 pushes darker blues toward violet, orange toward yellow and yellow toward green, but overall results are about average. Darker skin tones show a push toward a warmer orange cast, while lighter skin tones are just a shade pink. Incandescent: Both the Incandescent and Manual white balance settings produced very similar results here, if slightly cool, while the Auto setting was a bit warm. Personal preference will come into play here, as to whether you prefer warmer tones or more accurate, yet slightly cooler color. Exposure compensation was set at +0.3 for a slightly underexposed image, while +0.7EV was a little overexposed. Resolution: Our laboratory resolution chart revealed sharp, distinct line patterns down to about 2,000 lines per picture height horizontally and 1,900 lines per picture height vertically. Extinction of the pattern occurred just a little past 2,400 lines per picture height. Flash: Our manufacturer-specified testing (shown at right) shows very bright results at the wide-angle rated distance of 11.2 feet, though ISO is bumped to 640. The telephoto test came out just a little dim at 6.6 feet, despite an ISO increase to 480. Thus, the Samsung TL225's flash performs best at full wide angle, but at telephoto, you'll want to stick close to your subjects. The flash produced an underexposed image of our indoor portrait scene in Program auto mode at ISO 100. EV adjustment did not improve exposure. Switching to slow sync mode resulted in a better exposure, but with a significant orange cast from the tungsten lighting. +0.3EV resulted in a better exposure. ISO: Noise and Detail: Detail is quite good at ISOs 80 to 200, with some noticeable softening beginning at ISO 400. Chroma (color) noise is pretty well controlled at most ISOs, but luminance noise is a problem from ISO 800 on up. Detail and color balance are skewed at ISO 3,200, with very few concrete details outside of sharp contrast divisions. See Printed results below for more on how this affects printed images. Printed: ISO 80 shots look quite good at 16x20, with sharp detail and good color. ISO 100 shots likewise produce a quality 16x20-inch print. ISO 200 shots look better printed at 13x19 inches, and low-contrast detail starts to get a little softer. ISO 400 shots are better at 11x14, with more softness in low-contrast areas. ISO 800 images are a little too soft overall for printing at 8x10, but they look quite good at 5x7 inches. ISO 1,600 images also look good at 5x7, requiring no reduction in size to 4x6 inches. Overall, the Samsung TL225 produces files that print very well, with each ISO sensitivity offered printing well at a usable print size. Shutter Lag: Full autofocus shutter lag is very good, at 0.36 second at wide angle and 0.47 second at full telephoto. Prefocused shutter lag is 0.126 second, actually on the slower side compared to average. Cycle Time: Cycle time is fair, capturing a frame every 1.91 seconds in single-shot mode. Flash Recycle: The Samsung TL225's flash recycles in about 4.5 seconds after a full-power discharge, which is pretty good. Low Light AF: The camera's AF system was only able to focus down to just below the 1 foot-candle light level without AF assist enabled, but the TL225 was able to focus in complete darkness with the AF assist LED enabled. USB Transfer Speed: Connected to a computer or printer with USB 2.0, the Samsung TL225's download speeds are pretty fast. We measured 5,353 KBytes/sec. Large capacity microSD/microSDHC memory card. These days, 4GB is a good tradeoff between cost and capacity, but if you plan to capture many movie clips, 8GB should be a minimum. I can easily understand why the Samsung DualView TL225 and its less expensive sibling, the TL220, are big sellers. The second screen makes it stand apart from the hundreds of digicams introduced every year, and actually does help get quality self-portraits with ease. The fact we're in a world of people who like taking self portraits with their friends adds fuel to the sales fire. We have a few minor issues with the camera's interface and its uneven photo/video quality, but for people who want to document their lives 24/7, populating their Facebook, YouTube, and Twitter pages with portraits, the Samsung DualView TL225 is tailor made for the job, and earns a Dave's Pick.